FSU Adjunct Instructor, Allison Milham, attends Guild of Book Workers Annual Conference October 8-11, 2014. This years conference, held in Las Vegas, NV, included demonstrations on both historic and contemporary binding structures, presentations on conservation and a vendor fair with book arts supplies from around the world. 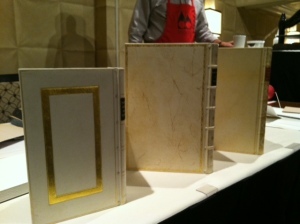 The conference is a wonderful opportunity to connect binders, printers and other book arts practitioners. 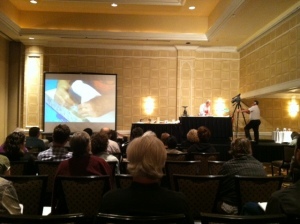 Participants attend presentations by leading experts in the fields related to the book and paper arts. The Guild of Book Workers is an international organization, founded in 1906, that promotes interest and awareness of the tradition of the book and paper arts. Allison serves as Chair for the the Southeast Chapter of the Guild of Book Workers, which offers workshops and exhibition opportunities in the book arts to regional members.